Special Equipment: Projector and screen with audio and video capability for Power Point presentations. Flipchart and markers for writing workshops. In this 1 hour visual presentation, Rina looks back over her own career, using examples of the books she has written, she asks the audience to think about where stories and ideas come from. She shows how a book comes together, from first idea, to first draft and through the re-writing process. The last twenty minutes of the presentation are interactive. This presentation will appeal even to the most reluctant readers. 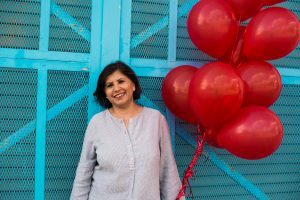 Inspired by how Rina wrote her own book – Holi Colours, she takes the participants on a fun and engaging journey where they explore colour through their own senses. It’s great for beginning poets and the workshop will be adapted with more sophisticated content for advanced writers. In this fast-paced workshop, participants will explore how they can use their own experiences and curiosity and create compelling stories and poems using lyrical language. Unusual exercises help them discover the joy of playing with language. The workshop ends with student readings and there will be a hand out for teachers. Rina Singh is an author, presenter, and writing coach. She has an MFA in Creative Writing from Concordia University, and a teaching degree from McGill University, Montreal. She is an internationally published children’s author and has written many critically acclaimed books for children including A Forest of Stories, which has been translated in several languages, including Spanish and Korean. She has written an award winning biography on the Inuit artist –Pitseolak Ashoona. Her most recent publications are Diwali: Festival of Lights (nominated for the 2017-2018 Red Cedar Award), Nearly Nonsense and Guru Nanak: The First Sikh Guru and Hindi for Heart, which she did in collaboration with the Oscar winning Indian lyricist, Gulzar. She has taught art, drama, and writing in Toronto for the last 25 years. She is passionate about integrating the arts in education. Her Grade 8 students have acted in and made award winning short films, won Spoken Word competitions and have exhibited their art work. Rina has done readings and workshops in literary festivals across Canada. She presented at the Asian Festival of Children’s Content (2014) in Singapore and Reading for the Love of it in Toronto (2015). Rina lives in a blue house in Toronto. Surrounded by tall trees, birds, squirrels, a rabbit, and a fish pond in her garden, she hopes to write many more books for children.